"Little ribbons" in Italian, this shape originated in Rome. 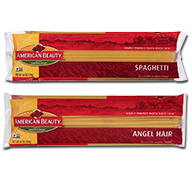 These flat wide pasta strands are made in egg and egg-free versions. Fettuccine is classically paired with Alfredo Sauce, a rich cream sauce with Parmesan cheese. This robust pasta is best in entrées and side dishes. Cream sauces, olive oil or butter pairs well with Fettuccine, but tomato sauces of medium to thick consistency can also be used.